Cruelty-Free + Vegan Makeup Haul! Hi there friends and lovely humans! Let's cut to the chase. You may or may not be vegetarian or vegan, but how aware are you about whether or not your beauty products are being tested on animals? (not cool!) Are there animal products IN your makeup? Even if you believe that you could never give up EATING animal products, there is still plenty you can do to alleviate animal suffering simply by properly vetting the other products that you buy. It’s important to know that “Cruelty-Free” + “Vegan” cosmetics don’t always go hand in hand. It is possible for a product to be vegan (more so accidentally) yet NOT be cruelty-free because they DO still test on animals. It’s also possible to be cruelty-free yet still use animal products or by-products in their ingredients which means of course- it’s not vegan. So the next time you’re shopping for makeup, try these cruelty-free + vegan Products! All Tarte products are cruelty-free and many are also vegan. They are always formulated without: Parabens, Mineral Oil, Phthalates, Triclosan, Sodium Lauryl Sulfate, and Gluten. Hypoallergenic. The Concealer is my favorite concealer I've ever had. A little bit really goes a long way as its nice and pigmented. It's creaseless and waterproof so I can wear it while teaching yoga or while sweating on my own mat. The bronzer is really pretty yet subtle enough so that I don't look overdone. Paired with the blush, my look stays sun-kissed and natural. Perfect for the beach or dressed up in the evening with my eye shadow palette. The finishing powder is my ideal final touch for my skin as I tend to get a bit of shine around my t-zone. This translucent, silky powder is just what I need for a smooth finish. Oh....and this mascara is INCREDIBLE!! My lashes have never looked so long-- seriously, I'm obsessed! 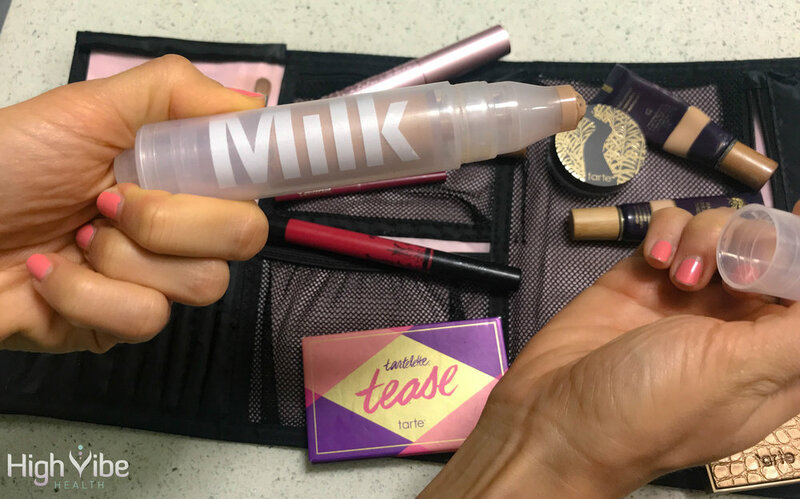 “All Milk Makeup products are cruelty-free and made with the best possible ingredients, with hydrating jojoba, coconut, orange peel, and grape seed oils; fruit and vegetable butters like mango and shea; and packaging that allows for minimal to no preservatives... Milk Melt Technology is our secret weapon formula made up of a unique blend of coconut waxes that melt into skin on contact with body heat. That means your makeup blends seamlessly into your skin, rather than sitting on top of it. And who doesn’t want that? Cruelty-free. Preservative-free. Many vegan products listed by collection. Healthy and convenient products. Foundation: Available in 8 fresh shades. Sheer, buildable coverage, dewy finish, and SPF 30 protection. Infused with a blend of avocado, mandarin, grapeseed, and olive oils for lasting hydration and a natural glow. Brushless for on-the-go application. Please note that this foundation is not recommended for those with a sensitivity to citrus or coconut oils. I don’t like to wear heavy makeup and prefer a soft, natural look. This coverage is ideal and feels totally weightless! It doesn’t even feel like I’m wearing any makeup! For even lighter coverage, blend with a primer or moisturizer. Super easy to apply, either by rolling directly onto skin, or onto the back of my hand and then using a brush to paint it on. (I feel so fancy when I do that! lol!) I also love that it incorporates antimicrobial silver to keep formula extra fresh. So cool! "Although the FDA hasn’t established a regulation for what it means to be “vegan,” we define it as as a product that does not contain any animal products or by-products, and has not been tested on animals. Kat Von D Beauty never tests on animals—and never will." Kat Von D Beauty products marked #VeganAlert indicate that the finished product is vegan. Any other products not marked as such as unfortunately not vegan. Products do use natural moisturizers, including Vitamin E and Sunflower Seed Wax. I have loved this lipstain for years! It truly does last all day, doesn't dry out your lips or smudge off for any reason. The colors are so unique, I'm always complimented on my shade! There are many other brands and products out there that fall into the cruelty-free category as well as products that are cruelty-free AND vegan. Do your best research to find what resonates best with you. *While I do advocate for a primarily plant-based lifestyle, I will also be real with you and promise that I am NOT the vegan police. HOWEVER, with that said, if you are going to be eating animals, then I sincerely implore you to be as mindful as possible at all times. For example, if you do eat meat, maybe (hopefully) you will choose free-range, antibiotic-free chicken/eggs or humanely-raised, grass-fed beef… and you may even try to make sure that that sh*t is organic while you’re at it. Go you! You’re on the right track.